A headless rag doll greeted us as we entered the boarding house of an Arizona ghost town. The floorboards, what was left of them, were covered in dirt. On closer inspection it wasn't dirt at all but rather the excrement of a million bats. I'd suddenly had enough of ghosts for one day. I shivered as a jolt went up my spine. I needed some fresh air. I could have sworn that the headless doll snickered at me on my way out. But can a doll snicker without its head? It must have been my imagination. Tired of the ghost town, we drove off. Further down the road, the landscape opened into a vast valley. A singular cross punctuated the horizon. It was a photographer's dream—and yet another remnant of people who had come and then left. More ghosts. The giant cross seemed assertive but beneath its bravado was a stark and sun-bleached loneliness. Its concrete seemed impermeable yet tiny cracks in its structure told a different story. The sun, the wind, and the rain were doing what they always do. The cross will crumble with time. I walked around the monument. It was the rare photographer's moment where everything looked good. Dramatic. Photogenic. 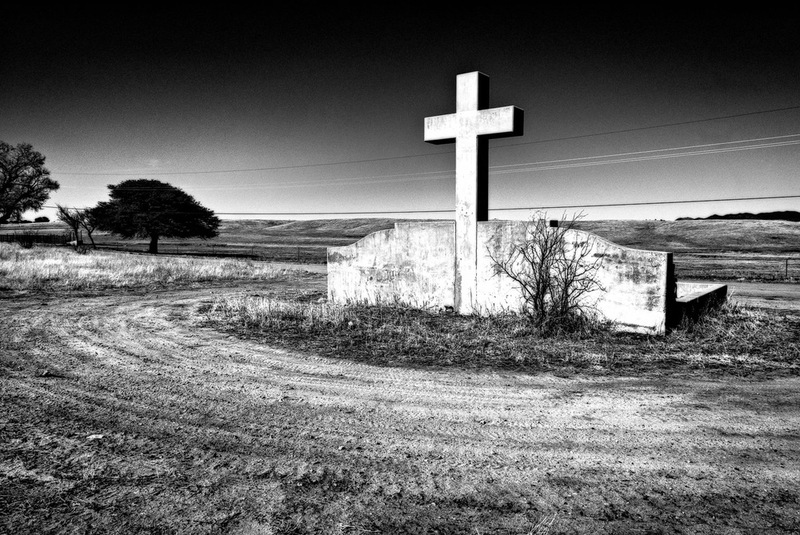 I recalled the days of Georgia O'Keefe and Ansel Adams and their love of crosses. The Spanish had marked the Southwest territory well. There is, indeed, something about these old crosses that is compelling. To me it's the axis mundi that I find so alluring—the intersection of the earthly plane with spirit. Five minutes of photographing the monument was enough. I started to think about the headless rag doll again and I was ready to move onward. As we drove off, I looked at the cross through the rear window of our car as it was swallowed by the horizon. It was as if a vast, rolling sea had gobbled it up. I turned to look ahead and see what might be coming next.